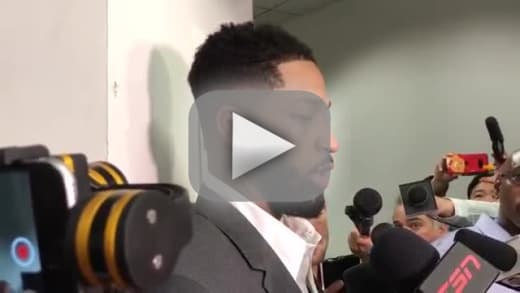 Tristan Thompson Curses Off Reporter: Watch Him Lose It! Tristan Thompson has had it. He's clearly sick of answering certain questions and of trying to placate his critics. He knows he continues to lose, but he insists that he's trying his best and is annoyed at anyone who says differently. Seriously, Thompson doesn't want anyone out there questioning he or his team's defense against the Golden State Warriors any longer! Oh, did you think we were talking about Khloe Kardashian and Thompson's penchant for cheating on her? We're talking about the fact that Thompson and the Cleveland Cavaliers are down two games to zero in the NBA Finals and are coming off a 122-103 blowout at the hands of the Warriors. The 27-year-old power forward was very obviously taken aback when one reporter asked on Sunday night whether he felt “helpless” guarding Warriors star Stephen Curry… after Curry netted a record-breaking nine three-pointers in Game 2. Tristan couldn't believe this inquiry was even uttered. “We did a good job. When I’m switching on him, I’m guarding him. I am never helpless with no guy in the NBA. F-ck that. F-cked up sh-t."
Thompson does take his defense very seriously on the court. And, for a guy his size, he does do a strong job staying in front of Curry when he's called on to switch. But we're talking about the best shooter of all-time here. The guy just makes some crazy shots. Still, Thompson is teetering on the edge of a breakdown here. He actually got ejected from the first game of the Finals after shoving a ball into Draymond Green's face. Is the pressure of his professional life and his rocky personal life finally getting to Thompson? "At the end of the day, if you don’t give effort and you don’t play hard, you’re never going to give yourself a chance to win,” Thompson also said of Game 2. “You control what you can control. Just go out and play. Miss or make, you think you got fouled, you think it’s a travel, you gotta get back on defense and communicate. "That’s what Golden State wants. They want you to hang back, complain to the refs and complain because they’re gonna come down and knock a three in your face. "We can’t be worried about that." No, but Tristan can worry about whether he'll have a chance to watch his daughter grow up or whether Kardashian will take back to Los Angeles. Emmy Awards 2018: Nominations Revealed! Leighton Meester Doesn’t Miss Gossip Girl. Here’s Why. Next story Eva Marcille to Join Real Housewives of Atlanta Cast! Previous story Taylor Swift: Fans Rave at Her Speech for Pride Month!